I’M GETTING OLDER – WHY BOTHER WITH EXERCISE? It is well known that exercise is good for you, but as you get older, exercise should remain an important part of a healthy lifestyle. Exercising when aged 65 and over has been linked to better long-term physical function and improved cognitive function and is linked to improved outcomes in so many diseases and conditions associated with ageing. With the emergence of ‘lifestyle medicine’, exercise can now be prescribed in a health setting to both treat disease and promote general wellness. It is important to use exercise and physical activity as part of a well-rounded approach to lifestyle. A healthy, balanced lifestyle can be thought of in four main areas: exercise, diet, sleep and relaxation, and it is important to balance exercise with these other three concepts. This article outlines some of the clear links between exercise and disease, some ideas to help you get started and five top tips for exercising as an older adult to maximise your time and optimise lifestyle. Cardiovascular disease (inc. high blood pressure, heart disease and stroke) The association between exercise and heart disease is well established and research demonstrates a strong link between increased physical activity and reduced risk of cardiovascular disease. There are also positive links between exercise and improving outcomes following incidents such as stroke and during cardiac rehabilitation. Dementia Physical activity has been shown to give a positive impact on cognitive performance, as well as reducing depression, movement problems and other behavioural symptoms associated with dementia. Depression In the UK, depression is estimated to affect 22% of men and 28% of women aged 65+ and is often left undiagnosed. 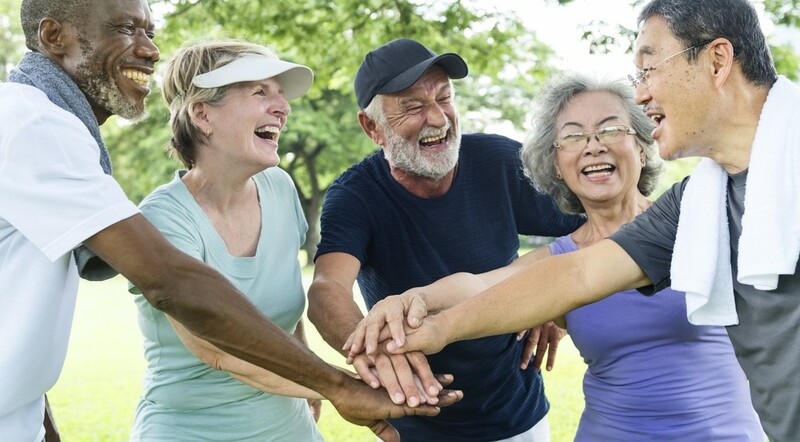 A collation of relevant research has shown strong evidence that tailored physical activity can reduce the severity of depression in older adults. Cancer Exercise has shown benefits in multiple aspects associated with cancer, including prevention, prognosis and cancer-related fatigue. Arthritis Activity and movement are greatly beneficial for rheumatoid arthritis, both for symptom control and slowing disease progression, although there are often barriers to sustaining exercise. Physical activity, particularly water-based, are also associated with an improvement in symptoms of osteoarthritis. COPD (Chronic Obstructive Pulmonary Disease) COPD is classically associated with a reduction in exercise tolerance, however aerobic, resistance and balance training prescribed as part of pulmonary rehabilitation have all shown to improve symptoms, exercise capacity and survival in people suffering from COPD. Falls Falling accounts for the majority of accidents in people over 65 and has strong associations with disability and reduced survival in the long term. Exercise-based interventions for those who are frailer and most at risk of falling have shown improved overall outcomes, both in terms of falling and general health. The NHS recommends that adults over 65 should do at least 150 minutes of moderate activity (such as walking or water aerobics) or 75 minutes of vigorous activity (such as jogging or fast swimming) per week. For example, this can equate to just over 20 minutes of walking a day. Whilst keeping this in mind as a guideline, it is important to adapt your own exercise routine to your individual lifestyle and capabilities. A great model to base this around is the four target areas of exercise: flexibility, strength, balance and endurance, with each conferring different benefits. Endurance training can include walking, jogging, swimming, cycling and dancing! Try to find something that suits you, your ability level and that you enjoy! Here are a few strength, flexibility and balance exercises to get started at home. Many of these can be adapted to be done seated where required. Repetitions: For all of these exercises, it is best to include multiple repetitions, but remember to adapt to your own abilities. As you exercise more, you may feel that you can do more repetitions. With all of these, start with the support you need and work towards completing each exercise unsupported. Adapt, adapt, adapt: Most exercises can be altered to suit different abilities or limitations. Whatever your situation, try to find something that works for you. Don’t underestimate balance and flexibility-based exercise: When thinking about exercise, most people immediately think about high-intensity sports, but there is a plethora of health benefits from activities like yoga and pilates, particularly for older adults, that are based more on developing flexibility and balance. There are great for relieving stress too! Try something new: The key to sustainability with exercise is enjoyment. Try a new activity or sport, try group classes or home videos. Change it up and have fun!